Thanks to Netgalley & Neuvel for the ability to screen this title. Themis file #3. What a trip we have been on. In the first novel, I had some issues with the total file construct. It was novel but it wore on me over time. The second book really had a good blend of elements and the balance of the world and it's ultimate showdown (if one could call it that) was well put together. With the third and perhaps final installment we are given the archetype of files/interviews but it reads far more normal than anecdotal files from vol1. Let that be worth what it is worth, I'm not terribly sure if it plays into or out of the overall flow from volume to volume. Pros or cons first... Let's hit my sticking points. What this volume does produce is a deep interpersonal relationship building (or destroying) story. As we know I have issues with characters who do not grow properly and Vincent in the early parts of this book really drove me nuts. I'm a father and as such, I reflect what would I do in a lot of his situations. I won't spoil the off-world elements but I feel that if a near decade of time rolls by we all change far more than less--especially if we are on another planet. I didn't see him change but his reasoning was a fairly large plot element so either it had to be, or there was just not enough other plot elements in the imagination to drive the levers forward to the outcome Neuvel wanted. My other sticking point is while they have this decade of development there just doesn't seem to be much of it. A scientist who can't learn a language, a linguist who barely gets a language, and again a near 10 years and I just don't feel anyone but Eva develops. Again maybe in some ways, this was necessary but it feels like such deeply lost opportunity that I find it really hard to relate. Relationship and growth plot devices aside we have a lot of intelligence in here. The geopolitical climate of Earth in absence has turned south in a big way. Governments full of the power hungry and a scared population creates populism that we can almost extrapolate from our current day affairs. Vincent has this diatribe on patriotism I'll excise once the book is published that I read like 10x for it's dead on nature. This is where I know Neuvel has a really keen eye on how systems operate (which is why I get irked when we don't see it consistently.) Interpersonal discussions between teams within the robots showcase so much humanity and how fast we can slip down a slope we potentially won't recover from. We are children and like children with big toys, we like to bang them together. What's mine is mine, what's yours is mine. Luckily we do have some intelligence, compassion, empathy, a bit of sympathy, and maybe with that, the world will find its way. I'm certainly not going to spoil it for you. The build-up and culmination of this chaortic moment in time play out very well. I couldn't have guessed it and am glad to see how everything resolved. Fun times! As I pause to re-read--I ponder. This book could have realistically been split into two books. One would have been just off-world and then the followup on return. Or maybe just a few foreshadows of files interspersed. The more I reflect on what happens off-world and how shallow it plays out it could have had a dedicated moment there where it was deeper and more meaningful. Ah well. A boy with an imagination can dream. Oh.. and I'll always have a sweet spot for Mr. Burns. I'd invite him to lunch any day of the week to hear one of his stories! It's a quality conclusion to the series and there's a crack in the door to the universe which has a lot of room for exploration in the future. 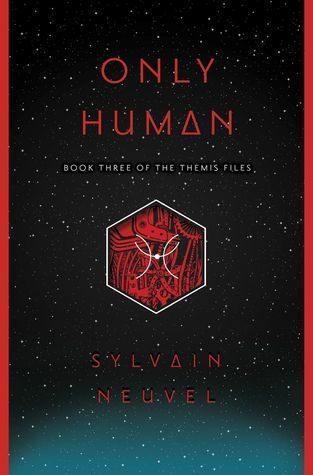 I like where Neuvel's mind wanders and since there are other projects in the works I look forward to where his mind travels next. Sign into Goodreads to see if any of your friends have read Only Human.